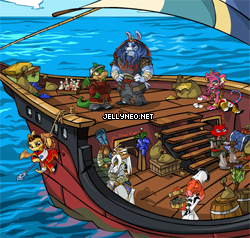 On the third of August, a mysterious ship made port in the harbor of Krawk Island. This ship, from an unknown land, was christened the Cyodrake's Gaze and is captained by a benevolent Gnorbu named Tuan. 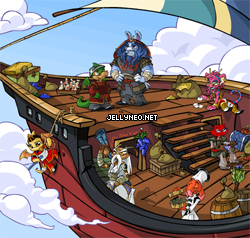 From this Neopet, you learned how they endured a vicious storm of epic proportions, and in the process, lost a faithful crew member named Hoban. September 13th -- Prizes have been released! You are now eligible to use the 'Cyodrake's Gaze' theme when browsing the Neopets.com website! Check out your User Preferences to change your theme. Awarded for guessing two or more correct answers on the "Who Pushed Hoban" questionnaire and then visiting this page. You got both the sidebar and avatar if you have two or more answers right. September 9th -- Hoban has been found! He was indeed pushed off the ship by that sneaky Chef Bonju. Congrats to those who guessed correctly, though no prizes for a correct guess were given out. It was a nice super-short-mini-plot. :P In other news, Shenkuu has been released! August 30th -- You can now guess where Hoban was pushed over... Click here to do so! August 29th -- The Gaze is back at Mystery Island! Also, the Map Room is now accessible. August 23rd -- The Lost Desert is the Gaze's current location of choice. Be sure to read Linae's story. August 19th -- The Cyodrake's Gaze has again disappeared. Where could it have gone this time? August 8th -- The Gaze has again reappeared! This time, they're docked on the southwest coast of Mystery Island. We've also added in a comics page showing all of the comics thus far. You'll be able to view them when the Gaze leaves Mystery Island! There is also a new chat board for the Cyodrake Gaze plot! August 6th -- Without notice, the ship leaves Krawk Island. It is currently unknown where the ship is located! This page was last updated on November 14, 2015.